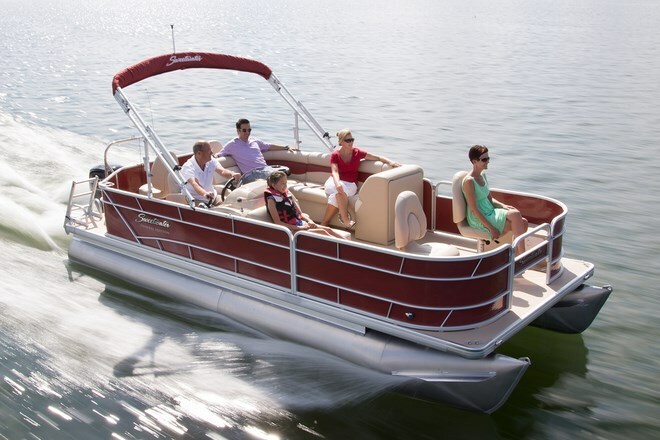 There are actually six model variations of Sweetwater’s 2286, each outfitted slightly differently, but one probably just right for the type of boating you would choose to do. This review will highlight the standard features and available options of the standard configuration 2286 (with no suffix attached). But with exactly the identical technical specifications, you could also choose the 2286 BF (with bow fishing chairs on the foredeck), the 2286 DL (with double stern lounge), 2286 FC (with two forward and two aft fishing chairs), 2286 FCS (with two stern fishing chairs), or the 2286 SLC (with two single stern chaise lounges). 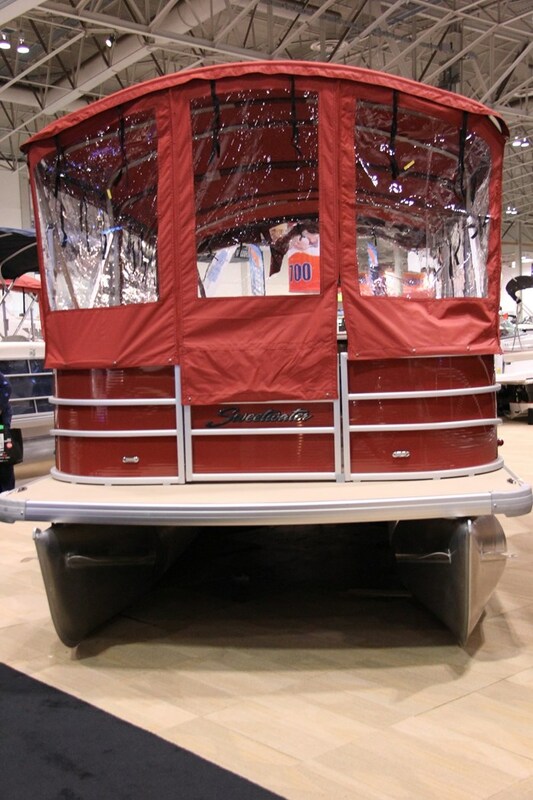 Sweetwater is part of the Godfrey Pontoon Boats family of three pontoon brands: Sanpan, with its “Focus on Luxury”, Aqua Patio, with its “Focus on Performance”, and Sweetwater, with its “Focus on Family Fun” and with three distinct series of its own – Premium Edition, Sunrise, and the standard Sweetwater series with its own “Focus on Value.” The six models of the 2286 are part of this latter series. These three Sweetwater series alone comprise a total of thirty-five model variations from eighteen to almost twenty-six feet in overall length. 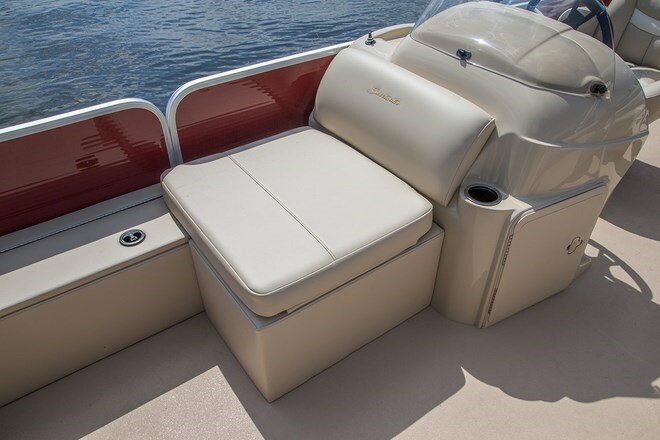 Chaise lounge style bench seat with padded backrests, storage below, and rounded forward corners fill each side of the bow area, the portside lounge being a three-seater while the starboard side lounge ahead of the driver’s helm could accommodate four persons. Between the portside and stern entry gates is an L-shaped lounge complete with standard table with built-in cupholders. Aft of this L-shaped lounge is a raised, flip-up, two-person padded sunlounge. The stylish molded driver’s helm on the 2286 comes complete with a windscreen, built-in cupholders, plus tachometer, speedometer, fuel gauge, voltmeter, and hour meter. The standard captain’s chair with fold-down armrests has pivot and slider adjustments. The standard 25-quart carry-on cooler stores within the helm console. Also standard is the Sony CDXM-20 player stereo with MP3 input and two speakers. This may be optionally upgraded with Sirius satellite, additional speakers and a more powerful and versatile Sony unit. 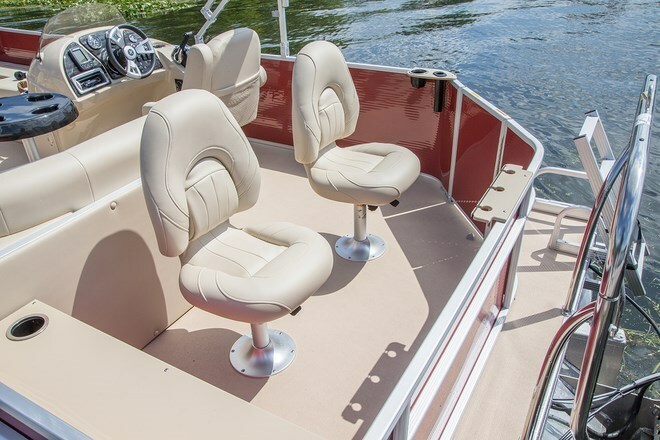 All 2286 model variations are rated for ten passengers and for maximum horsepower of 115 of the outboard brand of your choice and all ride on a pair of twenty-three inch diameter pressure-tested chambered pontoons with V-keels and forward splash fins. A pair of optional twenty-five inch pontoons raises the horsepower rating to 135 and carrying capacity to twelve persons while the upgrade to a pair of twenty-seven inch pontoons raises each of those numbers to 150 and thirteen respectively. You can also add full aluminum under-skirting or opt for Sweetwater’s T.O.T.A.L. 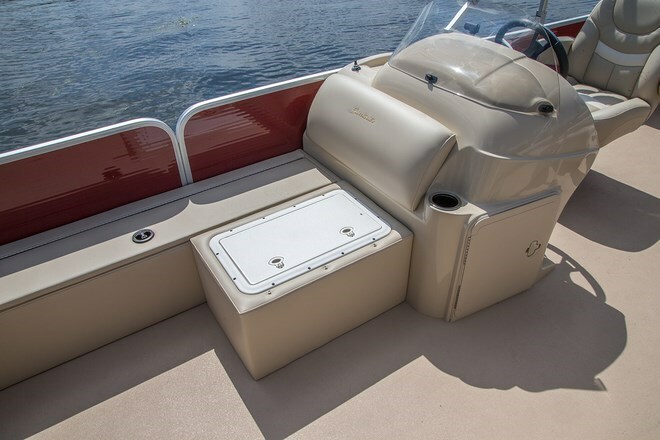 (Triple Outperforming Tube and Launchpad) package which includes the skirting and provides a third pontoon with lifting strakes and into which you can add the optional ski locker. Other standard features of the Sweetwater 2286 include a canopy with protective boot, playpen cover, plus interior courtesy lighting. To this you can add such notable options as a change room within the flip-up sunlounge with or without a porta-potti, mood lighting, LED underwater or underdeck or docking lights, two choices of ski tow bars, double canopy with or without full enclosure, tilt steering, reclining captain’s chair, a depth/fish finder, aerated livewell, extra table, and a movable, portable, padded cupholder package. With all of these model variations and available optional features, there most certainly would be a Sweetwater 2286 just right for you.